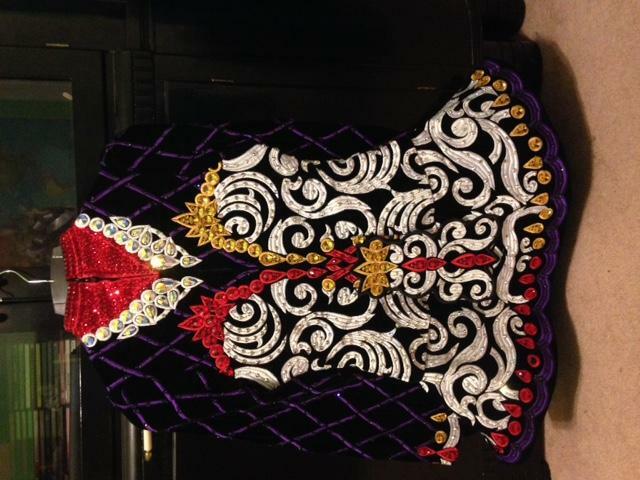 dance.net - Standout Eire Design Dress!! (10244174) - Read article: Ballet, Jazz, Modern, Hip Hop, Tap, Irish, Disco, Twirling, Cheer: Photos, Chat, Games, Jobs, Events! Gorgeous black velvet dress totally covered in white embroidery giving the beautiful effect of a tapestry. The embroidery is replicated on the back, completing the overall affect. Contrasting designs in red, gold and deep purple finish the design with a regal presence. Sparkling with well over $800 in Swarovski crystals this dress really shines. Worn by a very petite U18, this dress is most likely to fit younger, but please go by the actual measurements for fit and suitability. Made in late March 2016 and only worn a handful of times. No stains or odors. 2 Replies to Standout Eire Design Dress! !